Lots of the people who come to Calming Signals clinics are bright-eyed and hopeful that I have a signal to give horses to calm them down. Most of us prefer a horse who is calm and if I had a fool-proof hand signal that I could teach, can you even imagine how many rescue horses I could afford? “Calming signals” is a great turn of phrase originated by Turid Rugaas, Norwegian dog trainer, to describe the social skills, or body language, that dogs use to avoid conflict, invite play, and communicate a wide range of information to other dogs. I’d recognized similar language used by horses after moving to an isolating farm a few years before and first wrote about it in 2014. I love the words Calming Signals but to be an honest loudmouth party-pooper, people get it backward. We don’t calm them, they mean to calm us. We are the loud ones and the more we over-cue them, the more they try to convince us that they are no threat. We think we’re training, but to them, it’s always about survival. Horses would like us to know that they don’t live to please us. They have fully dimensional, sentient lives in the herd that don’t revolve around us. Safety is the goal, but peace can be boring. It isn’t all hearts and kisses; they have rivals and favorites. Some enjoy roughhousing, some have senior sensibilities. Some are born leaders, compassionate and protective. Some struggle with confidence and behave with loud bravado that humans mistake for “alpha” behavior, but then humans are always confusing rude habits for celebrity. Herd dynamics is subtler and more nuanced than we appreciate, and as much as we love seeing sweet mutual grooming sessions, it’s never that simple. Then just when things settle, everything changes. They evolve as they learn and grow, and it’s our job to try to keep up. Smart humans give up thinking they know anything. Andante is a coppery chestnut who started as a skittery draft-cross PMU baby. His rider was committed to improving through lessons and now he’s fourteen and they have built an enviable relationship. The more dynamic his work under-saddle, the more he grew in confidence, and eventually he became our gelding leader. We never dreamed he would have the temperament but affirmative training impacts everything, even herd behavior. A year ago, Norman came to the farm. A talented young draft-cross who tried so hard that there were permanent worry lines. Losing his herd was a challenge, changing barns is always hard, but Andante moved him from hay pile to hay pile, kindly and consistently, again and again, until Norman knew just where to be. Then he could relax. His rider reminds him to breathe, the wrinkles are gone, and he blows as the lesson’s warm-up begins. He loves to move in the arena and he’s the first to lay down for the morning group-nap. Happy boy. Clara is the only mare here at the moment. Her leadership style is to flag her tail, gallop churning circles and scream, “We’re all going to die!” The geldings try to ignore here but she persists. She would like you to know the world is out of control and being calm is for saps. You have been warned. Bhim is thirty-six inches tall but has more horse in him per square inch than the draft horses. Do not minimize him by calling him cute. His bravado is fear-based but listening to him gives him the confidence to sometimes sniff my hand. Four years later and he allows his feet to be trimmed. He has a long memory and it’s on me to prove humans aren’t all alike. He teaches the gargantuan thing called trust. Nubé, our most sensitive horse, seems to protect his feelings more. Namaste, the worrier in the group, doesn’t get corrected for it which is almost like having less anxiety. Roo, retired from a therapeutic program, is starting to like the idea of company again, but not much. Pearl, the neurologic donkey foster has gained enough weight and opinion to play. She dotters crookedly after us, ears flat; sometimes it’s good to be bad. Cupid, the most recent decrepit foster has finally allowed that weird animal, Edgar Rice Burro, to groom him for a moment. Cupid’s more open to him than me. No shade thrown, I understand that. Edgar Rice Burro’s our moral compass after all, for his long-ear eloquence. All donkeys become geniuses once you understand that stubbornness is a calming signal. My home herd has blossomed since focusing on Calming Signals and my training practices have evolved dramatically. I worry that this practice of reading calming signals encourages too much thinking on our parts. Sitting in a pen staring at horses is only a start. We must get into the conversation ourselves, learn to communicate in their language, and make ourselves more interesting than grass. Riding well can be a very healing therapy for a horse. Calming signal conversations in the saddle are affirmative training at its finest. Finally, a nod to my Grandfather Horse, I’ve written about him often. He was never the sentimental sort. He bore my passion like a rock under his saddle and did not suffer idiots (me). In my fantasy world, he isn’t loitering at the rainbow bridge. He’s young and strong, training some other hard-headed horse-crazy girl-woman, but maybe on a particularly good day, if I’ve managed to help a horse, he might look over and give me a small lick and half-chew. He was stoic and the loud-est-mouth party-pooper-iest horse ever… until we negotiated a democracy. “…loud bravado that humans mistake for “alpha” behavior, but then humans are always confusing rude habits for celebrity.” Hahahaha! Love this serious, thanks for all you do. Thanks, Patti. I’m glad for what you do, too. This mare I’ve been working was literally a screaming fighting mess, it was a revolt not about her mates or getting back to “the barn” or pulling or jibbing, she simply wanted a sympathetic rider, and is superb. I’d interpretet the screaming as a cry for help. Great stuff Anna, you give words to my instincts for which I had no words. The real party begins when all the guests are having fun. Thank you, Anna. Individuals all – each with their own personality, quirks & “after-effects” from how humans treated (or mis-treated) them. Sad that so many humans dont comprehend that individuality. Their loss! Isn’t that the truth? So much more interesting this way. Thanks, Maggie. Thanks for reading along, Lisa. Writers need readers! Beautifully written. My hope is that my old gelding finds me “more interesting than grass”, but I don’t kid myself. He loves his pasture 24/7. With a rueful giggle, that’s a noble goal, Mary Ellen. Sometimes that’s enough, depending on his age. Great comment, thanks. Major will be 30 in February! You had me laughing. You had me crying. Most of all, though, I am grateful for this and the concept of calming signals. My horse reminds me often and I am trying to pay attention. Thank you. Thank you, Celeste, for reading along and commenting. My horse Phoenix came to me a nervous, angry wreck. I was her 7th owner in her 13 years. She is now 20 and although she has permanent worry lines above her eyes, I finally realize I can’t make them go away. She is no longer the nervous, angry wreck she was when I got her. When she gives me calming signals I now know what they mean and respect them. Sometimes I have to give her calming signals too. But hanging out together, especially in front of her favorite tree, is one of our favorite things to do and that is as good as it gets. Acceptance is a huge win, on both sides. Great comment, thanks, Pam. Worry lines above the eyes? There is one here (not mine, belongs to the boss) with permanent sneer marks above the nostrils, which in most horses only appear when the ears are pinned and they are in attack mode. Horses hate to be sold on, and on, and on, while the very best are never sold at all. I had my “keepers” as I bred, and very much disliked to see years later what had become of those which were sold so we could keep our “keepers”. So many signals misinterpreted and people taught they mean something they don’t. Sigh, We have two horses here both of whom have been returned through no fault of their own, just people who got them who couldn’t or didn’t listen to what the horse was trying to say, until the horse had to speak so loudly the people were on the ground, and then of course, it is the horse’s fault. Since both of these guys are horses we have bred, we have a responsibility to them, we brought them into the world! I read your words and know at one time all of your herd were babies fresh and new, and life did not treat them well. (Don’t even get me started on the poor PMU mares and foals!) Many people seem to think ALL horses are the same, which is why I especially love reading your descriptions. You truly SEE the animals you care for, the individuality of them all. I don’t know if we will find places for our boys, but I do know they won’t end up in a kill pen through no fault of their own. I just wish there were more Anna Blakes in the world! Thank you, Jane. Most of all for being an ethical breeder… that might even make you a rare breed! And thanks for being part of this tribe, we appreciate your geldings, just as they are. Best to you and yours, as well. Perfect follow up to attending your Calming Signals clinic at Lucky Pup. I haven’t looked at my horse the same way ever since. I’m less focused on his “bad” behavior (which I think is his way of telling me to chill), just trying to understand what he’s telling me. And I ALWAYS turn off my cell phone now, no distractions. Helped that I couldn’t get a signal at the clinic unless I was at the house on the hill 😉 Lesson learned! Heheh. Great comment, Laurel. Thanks for coming and letting me mess with your focus. Yay, for your horse! Anna, some how I managed to delude myself into believing that I was pretty “chill” in the personality department, until I hit my forties; that’s when I got involved with horses. It turns out that they quickly and efficiently pointed out my personal misinformation. 20 years later, I’m still learning about the merits of being truly “chill”. The horse’s calming signals are a constant reminder. Thank goodness they are patient with me when I forget and get too big or too loud with a request. I have come to the uncomfortable conclusion that this will always be a struggle, but a struggle worth pursuing. Chill is apparently in the eye of the beholder; this is why riding is an art. 🙂 Great comment, Laurie. Love hearing about your herd. Grass seems to trump anything I could do to be interesting, but it is nice that they seem to like me hanging out while they graze. I get more soft eyes when I pay attention to their calming signals. Grass is medicine, the best is out in the lane, unpolluted. First thing I do when I take Cassie out of the yard (living on hay) is drop the rope and leave her for 15 minutes or so. And she’s watching me like “Is this really OK? You actually trust me not to run off? Such unheard of bliss.” For me its part of our deal. You cart me about safely and in great style, and I will treat you like the queen you are, in joy and light. She no longer maddeningly snatches at grass when we ride out, her belly sucking on the juice as we go. Not mine, I’m working her for my boss. They do like being listened to… Best to you and the boys, Therese. I’ve loved reading your Calming Signals posts and I’ve also found a couple of wonderful books that delve deeply into Equine Body Language by Sharon Wilsie. Horse Speak and Horse in Translation are both a fabulous resource for learning more refined communication and she offers a way to give the horse our own ‘calming signals’ (she calls it Zero or using an ‘O’ position). I highly recommend both her books as one is very pictorial and shows all the nuances of communication, while the other has no pictures aside from one diagram but talks about her journey and experiences that brought her to learn and now share equine body language and how we can learn to do it too. I’ve had horses for 50 years and considered myself quite adept at ‘reading’ them, and worked as an instructor for many years teaching natural horsemanship. I now see there’s a whole new level of communication that can be achieved if we understand and learn the horse’s language in far more detail first. Yay for you and Grandfather Horse! My sentiments exactly with my dear departed appy, Cappy. Though, I admit to hardly ever gotten it right, every once in a while I did get a few nods in my direction. Just wish I discovered your blogs much sooner for him. It is wonderful to read the many comments from long-time horse owners who now see the “Calming Signal light” that you have shined on us. 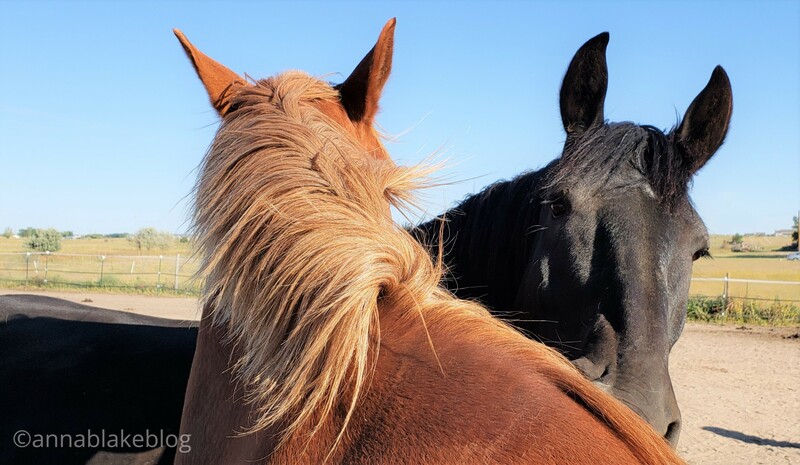 When it comes to my horses, I had always deferred to those who I thought were much more experienced than I; and yet for many things I had a nagging feeling theirs was not THE WAY. Yay for me to have found the truth as seen through your writings. Yay for my horses. Yay for all of us! Thanks, Lynell. I do love what this group is growing to be! “Clara is the only mare here at the moment. Her leadership style is to flag her tail, gallop churning circles and scream, “We’re all going to die!” The geldings try to ignore here but she persists. She would like you to know the world is out of control and being calm is for saps. You have been warned.” OMG I love your writing so much Anna! There are so many parts of this post that made me well up inside or chuckle through watery eyes. I couldn’t post every word again so I chose this about Clara. Please put your Calming Signals series in a book so we can learn and savor it over and over again. Thanks, Sarah. Grass is a high standard, moving along without a fight is a huge thing… thanks for reading along. Who knows what’s next?? I could hug you for this article. Beautifully stated. Thank you, Emily. I think they are the truest communication. I know these people: “stubbornness is a calming signal” and “being calm is for saps.” And the day I can be “more interesting than grass” and know what the hell I did/thought/breathed/imaged to achieve it, I will have reached the pinnacle. Snort! Great comment, Natrgrl. Thanks for the chuckle. Happy Festive Season and New Year to you and yours. The thing we call stubborn is shutting down, isn’t it? When things get too loud, I do think people do it as well. Thanks, Katrine. Best to you in the New year.